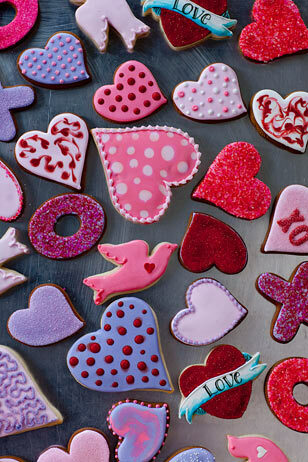 Whipped Bakeshop’s Valentine designs are almost too pretty to eat! Pastry chef and owner Zoë Lukas is an artist by trade. And one glance at her elegant creations of cupcakes, cookies and cakes on her website, whippedbakeshop.com, and its clear this is no ordinary bakery. Her intricate, custom designs-from Yoda cupcakes to elegant wedding cakes to oh-so-Martha vintage Valentine replicas-and attention to detail are part of her booming business and soaring city reputation. “Baking and art are my two loves so my cookies and cakes are really my canvases…in essence. I love looking at patterns and fabrics and I enjoy knitting and sewing. If I go to a museum, it reignites my creativity. I can see a vintage plate or a piece of beautiful stationery and get a concept for a wedding cake or a new cookie pattern; it’s a constant process for me. I really love and appreciate anything that is designed well and I try to transform that to my work,” explained Lukas. Lukas started Whipped Bakeshop in 2007 and this past October opened the doors to her Fishtown storefront to much aplomb, with the support of her husband, Brennen. “We started getting a ton of momentum with the business the first year through our Flickr site. My husband encouraged me to take pictures constantly and upload them on a regular basis and that really kept people engaged. Then the website followed, and Twitter took off. Now, we are here and business is very, very good,” said Lukas. Lukas earned her stripes as an apprentice at a petit four bakery in Olde City and worked in an administrative role at The Pennsylvania Academy of Fine Arts in between other pastry gigs. The sweet creations at Whipped Bakeshop certainly look appealing but Lukas is quick to explain her creations are also delicious. Her team works tirelessly editing recipes to perfect their taste. They will also customize and incorporate logos for corporate catering and events. Lukas, 33, is a native of Red Bank, New Jersey who grew up in Bel Air, Maryland and earned a degree in painting from The Maryland Institute of Art. This December in the heat of the holiday rush the phone rang in her shop and a certain name beginning with the letter “O” appeared on the screen. A flustered Lukas, knee deep in chocolate ganache and cream cheese frosting, took a deep breath before saying hello. “The phone was upside down but I could still read the caller i.d. It said the name Oprah Winfrey. I had no idea what was going on,” recalled Lukas. 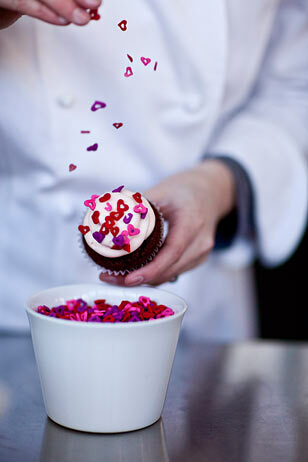 Whipped Bakeshop will be delivering Valentine’s Day weekend. Pricing for delivery to Center City is $20, pickup is free. Gift-wrapped Valentine cookie collections come in all shapes and sizes, from lovebirds and personalized heart tattoos to X & O cookies and big scalloped Vintage Valentine hearts. Red Velvet: 6 moist red velvet cupcakes iced with our old-fashioned vanilla buttercream and topped with pretty handmade fondant St. Valentine decorations. Über Chocolate: 6 rich chocolate fudge cupcakes—2 Chocolate-Peanut Butter, 2 Triple Chocolate, and 2 Chocolate with Vanilla Buttercream. Decadent! The Whipped Bakeshop Chocolate Waterfall Cake is a 6” chocolate fudge cake iced with chocolate Italian meringue buttercream and topped with a bittersweet ganache waterfall and pretty handmade sugar flowers. Choose your filling: yummy peanut butter buttercream or decadent whipped chambord ganache. We’ll even add a fun inscription of your choice. The cake will serve 4-8 guests. The Whipped Bakeshop Store is located at 636 Belgrade Street at the corner of Berks and Belgrade Streets in Fishtown. Visit their website, whippedbakeshop.com, for more information. Also, follow Whipped on Twitter @WhippedBakeshop. They are open Saturdays only from 10-6pm. Sunday through Fridays Whipped accepts appointments and pick-ups. 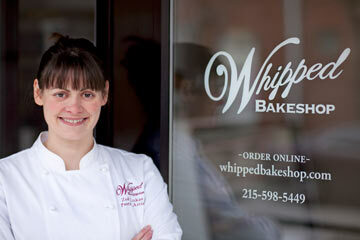 Call 215-598 5449 or email owner Zoe Lukas at zoe@whippedbakeshop.com.